Husband and wife hosts Giuseppe & Magda welcome you with open arms and warm smiles to La Cicala. Our guests find that our agriturismo offers a place of peace and tranquility where they can feel free of stress while walking or biking in the bucolic countryside of Carassai. We are proud members of Bike Hotel and Trek & Bike Partners and enjoy hosting bike enthusiasts, as well as groups of all kinds. La Cicala has a full, ultra-modern kitchen where we prepare delicious meals in the finest tradition of Carassai cuisine. Therefore, it will be a pleasure to have you join us for breakfast, lunch and dinner, as may suit your needs and schedule. We look forward to sharing some of our receipies with you soon! 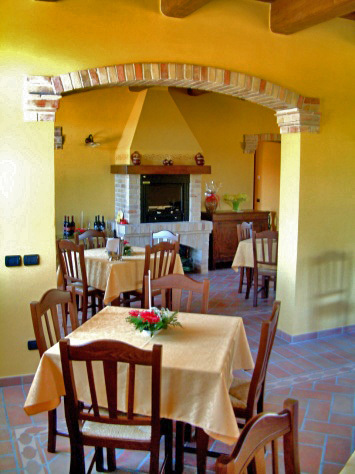 With only six rooms, La Cicala offers an intimate atmosphere where our valued guests are not lost in the crowd. From the sanctuary of our quiet location you can visit some of the many near-by historic villages, or just relax, as you may prefer. Be sure to sign up for our newsletter to receive exclusive information about our pricing specials, local events and more!